Announcing - Lalea Show 2011: Saturday, December 17th at 6PM. Admission: FREE! This year, Gboze is planning a show for you that will be a real treat. It will feature students who have been attending our drum and dance class for several years. We have invited Theodore Koukougnon and his family to be our special guests at the show. We hope the community will attend and welcome Theodore to the area. We are looking forward to showcasing the drum rhythms and dances that our students have learned over the years. Working on props for the dance. The echassier mask dance is performed on stilts. Masks are believed to convey messages from the spirit world. Papa Diarra tightens a djembe before the Lalea show. Watch this clip from the group's performance in San Leandro in November. 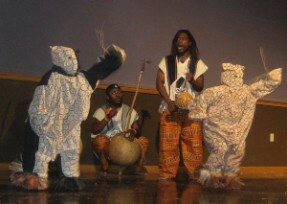 The Boloye mask dance from the Korhogo region in the northern Ivory Coast was performed for the Senin show, University of Nevada, Reno, 2009. This mask dance has many variations, differing from village to village. Please come and join us for the drum and dance class every Wednesday starting at 6:30pm. Details on Classes page. Watch this space for info about new workshops and upcoming performances. In the meantime, enjoy these pictures of Gbozé from the Senin (2009) and Lalea (2010) shows. Gboze leader Mailly Tagba (Francis) plays to the crowd at the River School for the Lalea show. Abel Guie beats a fast rhythm as the Zaouli mask dancer mimics the djembe beats with his dance steps. 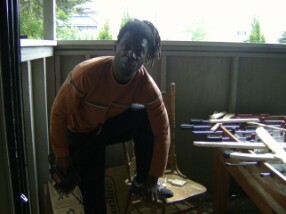 Salif plays the balafon while singing accompaniment. Multiple balafons with different tunings are often used together in performance. Two balafons were used for the Lalea show.